My homeschooling tips on how to make time for yourself will help bring your life back on track. I'm going to prove to you that when you look after yourself you look after your kids too! The time you spend looking after yourself will bring the peace and calm you need. By making time for yourself you will turn homeschooling into a wonderful experience for all of you. 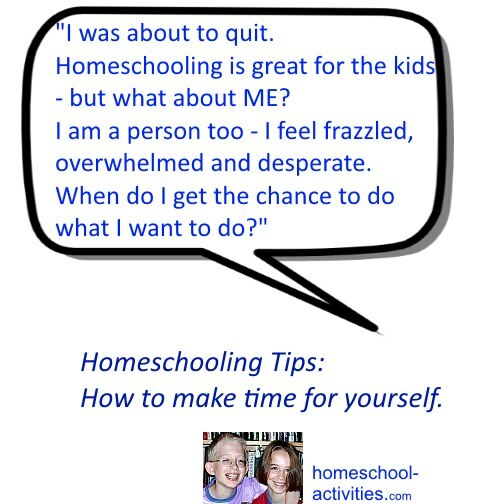 The danger with homeschooling is to feel you just haven't got time to make space for YOU. Especially if you have young children! "Sometimes my time alone is when I am off to shower in the morning. I will bring my iPad into the bathroom and surf the web a bit before I shower. Then, I will put on some of my favorite music or a teaching of some sort, and listen to it while I shower. What a practical and fun suggestion ....thanks Lisa! Check out how much time you're spending on the computer. How many times have you checked your e-mails? Did you really need to go on Pinterest again? I think you'll be surprised! This is a hard one! But you do need to put yourself first sometimes. 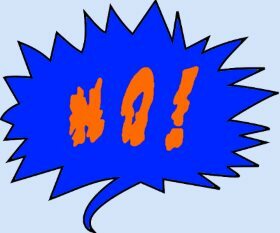 Learn to say "no" to requests to do things that you don't really want to, don't value or don't bring you satisfaction and joy. That includes homeschool groups! I think the pressure on homeschooling socialization means that sometimes we force ourselves to do things that aren't working well "for the sake of the kids." Homeschool groups are like all groups; they can be supportive and fantastic but they can also become so full of internal dynamics they are not a positive place for you - or your kids - to be. You'll be able to make time for yourself much more easily when you aren't so busy worrying about the kids! Trust that your kids will be fine - they will find friends in their own time and their own way. Look at my page de-bunking the social disadvantages of homeschooling to put things back in perspective. I hope I'm not kidding myself I'm the only one to feel like this. Homeschooling is tough - in exactly the same way as it's tough being the parent of a young child. No recognition. No perks. Definitely no income. But one look at the homeschooling versus public schooling argument and you'll know you don't really want to send your kids to public school. You just need to recognize that homeschooling is about ALL of you. Once you start to make the effort to carve out some time for yourself every day these feelings will subside. Pick some good audio books and substitute them for reading out loud to your kids. Sounds a bit of a cop out, especially because reading out loud to your kids is obviously such a good idea. But you can pick times to do that - and in the meantime use some space to do what you want! Librivox is just one site I've found which has free audio books and is a non-commercial, non-profit and ad-free project where volunteers read the books for you. Have set times where the kids do what they want while you have your own time for you. You'll see from my page on the effectiveness of homeschooling that there is evidence to show that kids absorb pretty much all they need to learn by themselves without being taught, at least up to high school age. What would you like to do? Start a website/blog like me (highly recommended! ), start a craft, it's entirely up to you! But relaxation and some time for peace and calm is definitely one of the homeschooling tips which you need to build into your day if your homeschool is going to really be a fun and rewarding place for all of you. Making time for yourself is one step in the right direction, but you can help yourself even more by feeling the power of affirmations to change your mood. 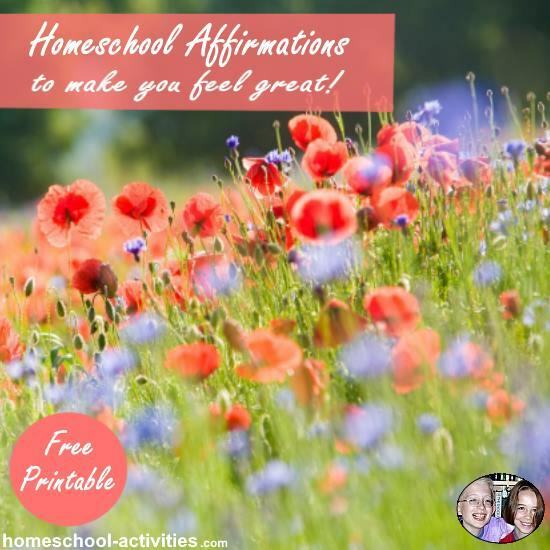 You can find a list of free homeschooling printable affirmations where you can pick out the words which sing to you and make you feel good. Having time to yourself is just the time when you can afford to be nice to yourself and affirmations are a great way to give yourself a boost and the strength to know you made the right decision. 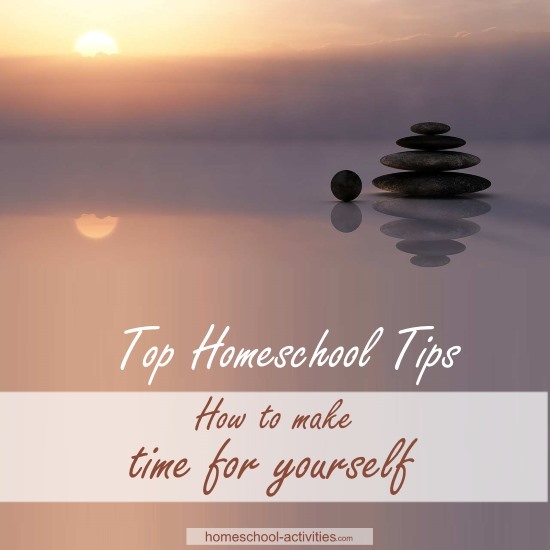 I hope my homeschooling tips will help you see that by making time for yourself you are actually making your time at home better for everyone.